Through updating 35 assignments of the Ten Courses, EWUeducation has ended its duty of updating assignments and reports yesterday, on 11 August 2011. After opening this site so far, it updated all the assignments and report which have soft copies. There are some exception, not ALL; some of the assignments’ group members requested not to upload their respective assignments here (where Shaon also worked as a group member). This site has been established to serve the students for making better assignments since the undergraduate university life of Shaon. From the record: this page first launched as ‘educationSHAON’ on 16 December 2004. This site passed many paths for last six years plus time. This site’s last assignment update was on 18 May 2008; last non-assignment update (only page update) on 31 December 2009. The last semester of Shaon at East West University was Spring 2009 and the page has been updated accordingly. And yesterday 11 August 2011, after almost 3 years, assignments are updated and for the last time. Thanks to all. In the last update, 10 courses updated, which include the final Project Work, 23 Assignments, 6 Reports and 6 Presentations. After all this yesterday the site updated to its old address in ‘ewueducation.50g.com’. Today, this site re-hosted to SHAON84 main hosting area. This site will now available in new address: ‘ewueducation.shaon84.com‘. The contents of the previous hosting area have been removed. Besides that, another academic assignment portal mbaEducation will now be available in another address: ‘mbaeducation.shaon84.com‘. SHAON84 mbaEducation page is now also available in following sub-domain. Activity > Del all files and folders of the server. Whole site transferred from “ewueducation.50g.com” address. All files in new folder named “/ewueducation”. Blog Posts JUL-SEP 11 (Current Page) – Updated with: Current note (Technical Note), Producer’s Note, mbaEducation Update Note. Update, Today’s Status, Technical Note & Producer’s note column updated with related texts. SHAON84 mbaEducation Fan Page & Group‘s Profile photo changed with new Sub-Domain (mbaeducation.shaon84.com). 10 courses updated which include the final Project Work, 23 Assignments, 6 Reports and 6 Presentations. Bottom & Credit Line – Each page of the site has got modified credit line & logo of SHAON84 over that line. Banner – Banner image modified. ‘SHAON’ replaced by ‘SHAON84′. Navigation Menu – Navigation menu’s individual image’s size, rollover image & number of images changed. FAQ & Be Member image removed; Condition & Contact Info pages’ link image added. Page Title – Each Page’s Page Titile Changed. Home – Update Scroll (Semester Update), text & its style at home page, side advertisement modified. New advertisement image added. Report – Updated with new reports. All Assignment – Updated with 35 new assignments. Condition – Some condition removed & text style changed. Contact Info – It’s a new page with contact information. Semester Update – Updated with update detail. Three pages removed because it’s thought that, these pages no more require to get maintained in current situation. The pages are: Be Member (Membership no more requires), FAQ & Welcome. The newly added page is the Contact Info page, with related contact details. All files of ‘asset’ folder removed. Update texts of EWUeducation’s Update, Technical Note & Status’ text updated. It’s EIGHT! This could be 115 days before, on 8 April 2011. But I’m happy for that, after all the celebration release came into light! I was afraid to see my lazy hours in earlier part of this year but I became hopeful while I analyze my last few days’ works. I was working day and night for different page’s updates and modifications. The content isn’t much, but the work behind them requires many sleepless nights and restless days. I always tried to find, what can provide the smoother experience in SHAON84 within my little intellectual capacity. In this celebration update SHAON84 do have many updates to share with joy. One big one is the home page. This is the first celebration of SHAON84 after it got rebranded (former ‘SHAON’). The date of celebration has some interesting side. Today is 2 August 2011. August is the 8th month of the year, and it’s SHAON84’s 8th celebration, and 2 cubes 8! Another interesting fact is the number of web pages in About SHAON84 and Personal SHAON84 is same, 19. And it came after deleting some pages. And it discovered later. Interesting, Hah? For the last eight years, SHAON84 has been trying to create such web environment in its own area, where a visitor can easily access to any part of the site. And, yes, finally, this year, SHAON84 is very close to have full mark in this issue. In the new home page there are at least two ways that will ensure a visitor’s wider accessibility to the whole site. There is a mini site map in the page which will help you to have a “Bird’s Eye View” to the whole site. This will help you a lot to access any important page of SHAON84. There is sitemap, too. I’m coming to this issue later. This is a great thing that I was looking for a long time and very luckily I got the code. Basically, it’s nothing but Google search which will search within the site. This is a great thing which will help anyone to find any required topic here. SHAON84 do have many accounts in different sites in online and I want to do connect with you with any or all social media where SHAON84 have account. In this update, you can get connected to different social profiles more conveniently, because, now the links are at the bottom of home page. In credit line, at the bottom of the page, many important URLs added for visitors’ convenience. Some URLs are of WordPress blog, where the SHAON84 Blog hosted. WordPress gives some good feature, among them one very powerful one is, Custom Build Form. SHAON84 do utilized that. Forms those are in bottom of the home page are: Feedback, Subscribe, Blog, Testimonial. In Contact page (in About section), another blog form added: Contact form. In designing the site, the color, design, visitor experience etc. were cared a lot. I gave a long time to test the site’s view and other issue. In this page, the presentation of providing update is easier. Not all the link will have own detail story on update – that’s the new practice for SHAON84. I hope this will encourage having frequent updates in SHAON84. This time, CSS (Cascading Style Sheet) has been greatly used for setting URL color. I think you may like this fun of URL color. A full sitemap has initiated. It will be monitored under ‘About SHAON84’ brand. I had a wish to have a sitemap for many days. Finally this came true. This will also help you a lot to find right thing. This site map also have search box, Tiny URL’s list, list of sub-domains. From this release SHAON84 will use tiny URL (account in Bit.ly) to promote links majorly in Facebook and Twitter. This will bring an opportunity to have wider choice to promote new and updated links. A new brand has been launched, ‘Xtra’, ‘SHAON84 Xtra’. Xtra will open a new door of freedom to launch new page and share them. The idea is, sometimes, it happens that, I have an idea on a topic that directly doesn’t match with any existing brand or page. In some cases, there is a related brand (or section) but if I want to add this page, that require to go through a time-consuming complex process; but time is limited. To manage this situation and to serve better, I firmly believe this page concept will surely increase productivity level and service level. Xtra don’t have any major content since now, but will come in near future. Each page of the Personal SHAON84 has got at least one change. In each page, a line to separate the page content and the credit line (at the bottom of the page), a green line has been put in between them. A bug has been fixed; the bug was: the menu and content at the right side ware not began from the same place at the top. All browsers, specially: IE, Firefox, Chrome & Opera showed the problem. It looked very odd. The solution was found many times back but it came in action after many days later. Besides, there are also major or little changes. Some page have been removed completely; like Contact & Schedule (it seems redundant), In Online (it’s redundant to contact page), Words 2 U (not important), Photo (decided not to promote any personal face photo of Shaon) & Text On Myself (not important and redundant). Personal’s home page got a new picture, Interest page got ‘some’ changes only, and My Chairs page has got a new style and additional information. I recommend to specially visit the Home page and My Chairs page. Like ‘Personal’, each page in ‘About’ section has got changes. Common change is the red line between the content and the credit line, that will differentiate the content and the credit line at the bottom. The same visible bug (like Personal SHAON84) was also fixed in About SHAON84; specially the pages those were under the sub-topic ‘Basic’. The bug was, the left menu table and right sided content were not in straight line (from top of the page). In this release, the deleted pages are: Sponsored Web, Subsidiary Web, Different Parts (Renamed and re-designed to Brands), Define Friend, Friends’ Groups, Org. Friend, Hearing You, Work Inside, Reg. Your Media and Short Overview (In Press). The major changes took place in the following pages: Aim & Primary Info, Profile, Brands, External Orgs, Contact, History, From The Dreamer (Photo removed) and The Logo. I recommend to visit: Brands, Contact and The Logo. 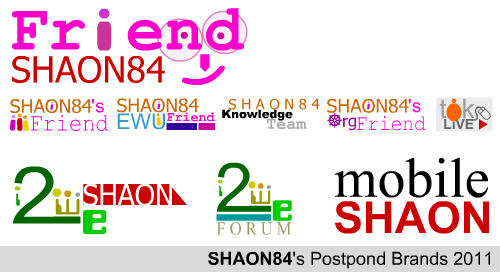 SHAON84 postpones the activity and pages of four brands, they are: Friend SHAON84, Mobile SHAON84, i2we & SHAON84 Org Friend (under About SHAON84). The detail of the whole matter can be found in the article titled “Producer’s Note: Statement for Postponed Brands: Friend, Mobile, i2we & Org Friend”. After ten months of re-branding of ‘SHAON84’ (which was ‘SHAON’ before), the web pages and contents of the old ‘SHAON’ has been deleted. Due to the possibility of creating identity problem, SHAON84 has decided to delete those pages physically. There are other updates too. The assignment portal SHAON84 mbaEducation has got relevant and necessary updates including assignments. You will find detail of them in mbaEducation ‘Latest Arrival’ page. Another, known bug of downloading some PDF files (specially files bigger than 512KB) of SHAON84 has been fixed. Prior to this update those files were hosted in free hosting areas. Now you can download them without any hassle (please report if you have any trouble). The files that were in that issue are: SHAON84 Annual Report of 2007, 2008, 2009; Spring 2008 issue of amaderStory (a publication of SHAON’s subsidiary amaderEWU). There are more details of the update story. Go to Technical Note of that update. In Download segment 1 file (following one) has been uploaded. The Finished Courses page has been updated. Due to some reason SHAON84 has taken the decision of postpone the following brands, they are: Friend SHAON84, Mobile SHAON84, i2we & SHAON84 Org Friend (under About SHAON84). This postpone doesn’t mean they are closed. The activity has been suspended before next notice. Site contents of the following sites have been removed. This postpone will also work for their respective sub-brands too. “Small Family, Happy Family”. Tok Live – A page where all chatting lines’ address were given so that anyone can chat with Shaon. It wasn’t a hi-tech page. Just the id of SHAON84’s Yahoo, MSN, Google & Skype Messengers’ id were there. The logo of the brand and sub-brands, specially ‘tok Live’ were highly appreciated by many people. Along with the main brand, all sub-brands will also be postponed. SHAON84’s recent choice is to, have less but powerful active brands/sections/accounts. As it’s not a page, that can or need regular update, the decision came in that hard way. You can still get all connectivity links in Contact page with more and more details. I thank SHAON84’s all new and old friends for being friend. It’s a bit embarrassing while someone hits SHAON84 and next click goes to Mobile page with higher curiosity level. Mobile SHAON84 page had been constructed to serve mobile WAP users. I personally had tried to learn WAP technology through online study, but my little intellectual capacity couldn’t meet the requirement. Later, SHAON84 released a light page (less coded) for people who visit SHAON84 through mobile. The plan was to give each update in that page. But later the rule didn’t follow the path. Mobile page also enriched with mobile-screen size wallpaper designed by SHAON84. Music tracks of SHAON84 were also available to download from here. I thanks to all who at least clicked the link once and who didn’t ever! i2we- is a subsidiary brand of SHAON84. The chance to bring this brand back in operation is substantially more, comparing to other postponed brands. The idea was, bringing a parallel platform where, SHAON84 can legally break its one of core law. SHAON84 only promotes the stuffs from Shaon; but i2we was developed for such a purpose where others’ good contents can be promoted; which would help commons. But, due to lack of update and time this page’s activity has been postponed. The sub-brand i2we Forum was build for creating a forum to connect the similar interest group; but it didn’t have any formal structure. This was introduces to create a relation with different organizations. But later, SHAON84 didn’t give much concentration to it. However, for the similar reason to “Friend SHAON84”, this sub-brand has been chosen to be removed.